You can implement integration of the system with different telephony services. You can read here about the telephony services that can be connected and how the integration can be implemented. It is also possible to implement integration through our open API. Note: there is a limitation on telephony types depending on countries. I.e telephony choice depends on country system specified in settings. Making calls directly from the system, not dialing it in a telephone set. If the customer number is already in the base, he is autodetected upon an incoming call and a notification appears. It is possible to create order or customer card directly from the call notification. Hearing call records directly from the system (if the operator PBX allows to do it). 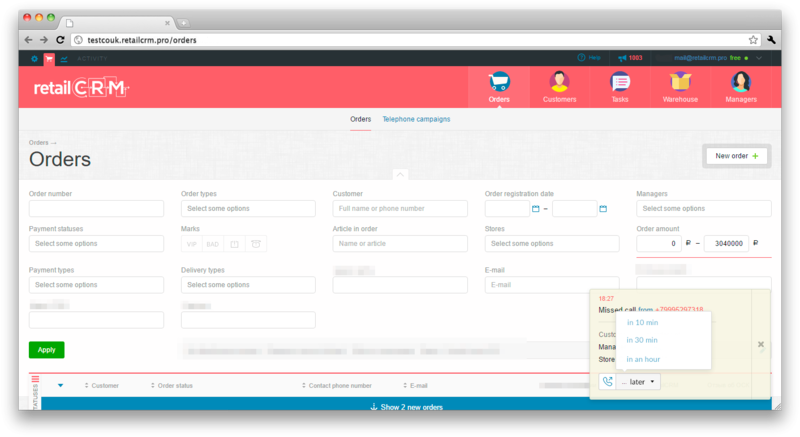 Let’s have a look how to use telephony on the system order page. This function works the same way in the customer card. 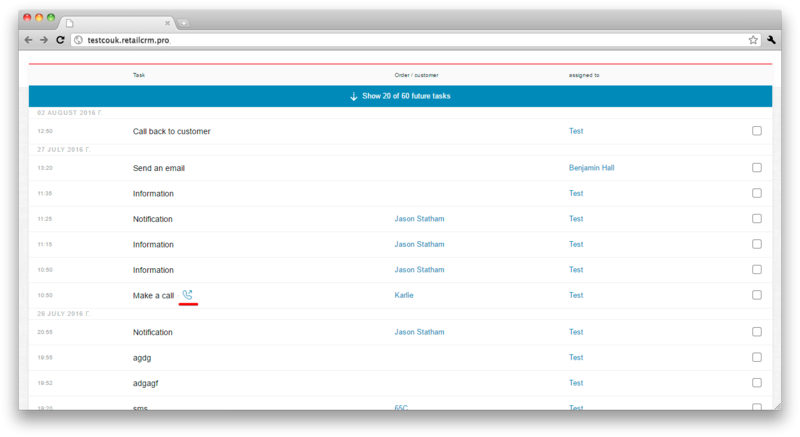 On the order page near the telephone number field there are elements of work with telephony - call button, time (shows operator and customer time zone when pressed), button to add second telephone number and the link to customer call history. Pressing the call button a request to dial a number will be sent to PBX. After that a call from PBX will be made to operator’s PC. Upon answering the call an automatic dial of customer number will be made and the connection will be established. A notification appears in the right bottom part of the screen upon the incoming call, displaying the information about the caller. Time, when the phone call was received. The telephone number that the call came to (if the correspondence of external number with the shop is configured, the shop name where customer calls will be displayed (lower notification). If there is no corespondence, the number where the call goes to will be displayed (upper notification)). 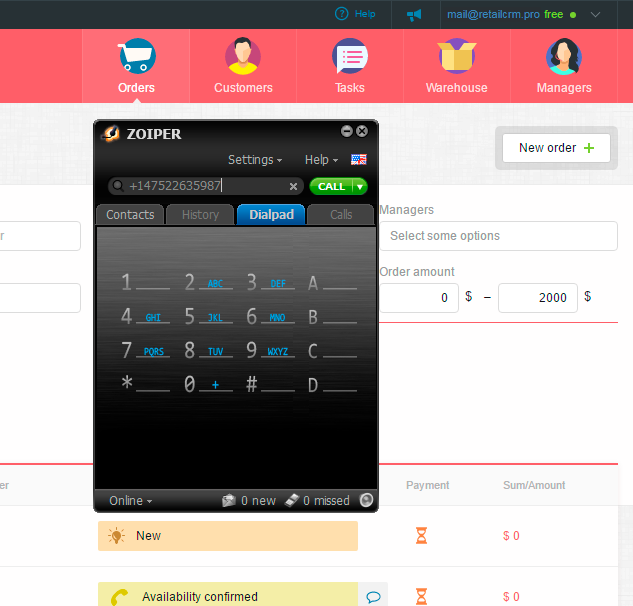 Two buttons for instant creation of order or customer with a filled telephone number. Time when the call came. Full name of the customer (with a link to customer page). What phone number (or shop) the client is dialing. Information on last order (with a link to the order). Responsible manager (with a link to his page). 20 seconds after the appearance the notification is wrapped to minimized mode, no matter whether you answered or missed the call. By next pressing the notification will unwrap. Two buttons are added to the unwrapped notification: for making a call directly from the notification and setting task “Call back the number…” after 10 / 30 / 60 minutes for your choice. If you select the option “Call back the number…”, the task is created where it’s possible to call back directly from the task. 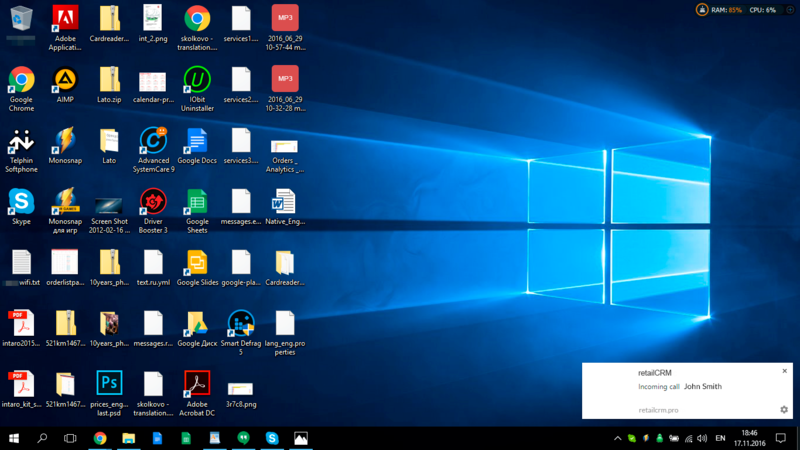 Also, if you have a system tab open, but you work in another tab, program, or just a desktop is open, the browser gives a short notification about the incoming call. To close the notifications press the cross in the right part. 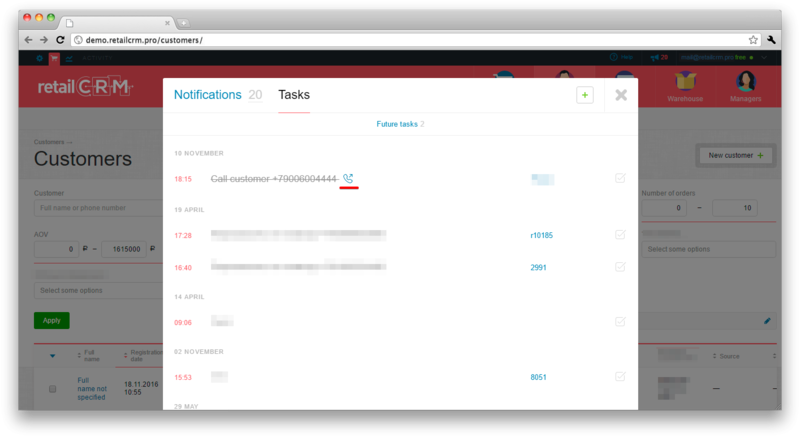 It is also possible to call customer from a task, notification or tasks list using redial button. Important: it is possible only in case if the task is created from the call card. Further let’s have a look at each option on the example. Note: call history fetching is not supported in demo version of the system. 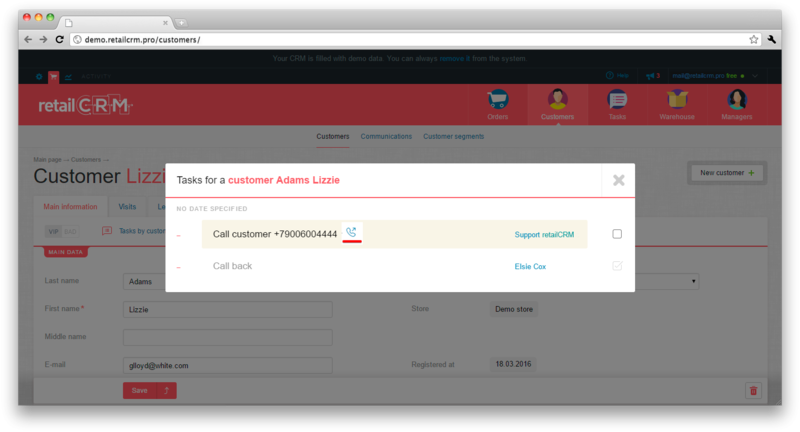 To open calls history you need to press the similar link near the phone number in the order or customer card in system. Note: the link “History of calls” appears only in case, if a connection with the customer was established. If there is no phone number attached to the customer, the link will not be displayed. 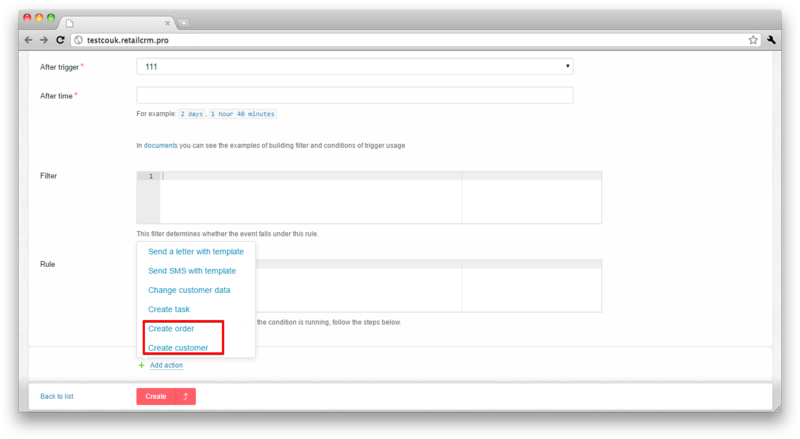 If the parameter "Attach calls history to customers and orders" is enabled, all calls are displayed in the history. 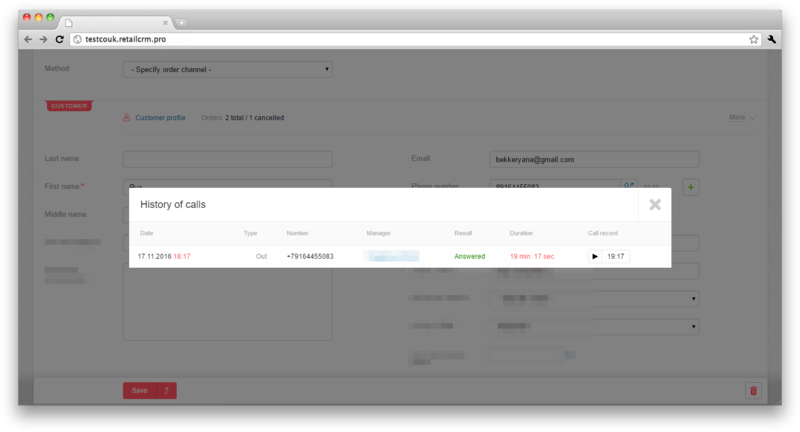 The full history of calls (on a single customer) is displayed in the customer card. The history in the order depends on the way the telephony is configured, when the order was created and the calls were made. If you open calls history in th order, you can hear all call records of this customer. Note: when connecting through API, the capability to listen call recordings depends on integration module settings. The module is written individually for each telephony and in some cases the operator doesn’t offer an opportunity to listen call recordings through API. All the history of calls on all customers and orders can be seen in section System > Customers > Communications. Look for details in section Call list. “Simple calls” do not return call result (answered, not answered, busy). All the rest information is saved (call date, manager, telephone number, incoming/outgoing, duration). For some telephonies (Asterisk, Avaya IP Office, NEOPbx) call hearing is available. One more capability that becomes available for system integrated with telephony is creation of triggers with a “Missed call” event. This feature is very useful for keeping customers, for managers to be able to quickly call back customers, who couldn’t get them on the phone. For example, You created a trigger with a “Missed call” event and applied the condition, that the missed call, that comes from the order in “New” status, needs to be tracked (look for condition examples in section Triggers for missed calls). You add an action, that the manager needs to be sent a notification on such missed calls, for him not to forget to call back. Other actions, sms, emails, setting a task can be selected for other cases. If a call was received from a customer, who doesn’t exist in your customer base, it is possible to “Create customer” or “Create order”. Note: if external numbers were specified during integration with telephony, then when creating the order/customer page from the call card, the store that corresponds to the external number will be automatically specified. This connection works only if the telephony sends information about the phone number of the store to the system and the corresponding connection between the phone number and the store in the system is configured. Important: it is not recommended to configure a trigger with a “Missed call” event for “Simple calls” system, as “Simple calls” load history from the customer browser. It means, that if there were 10 calls at night, they will be loaded to system only at the moment of manager authorization. As a result, a trigger with a “Missed call” event will not work. 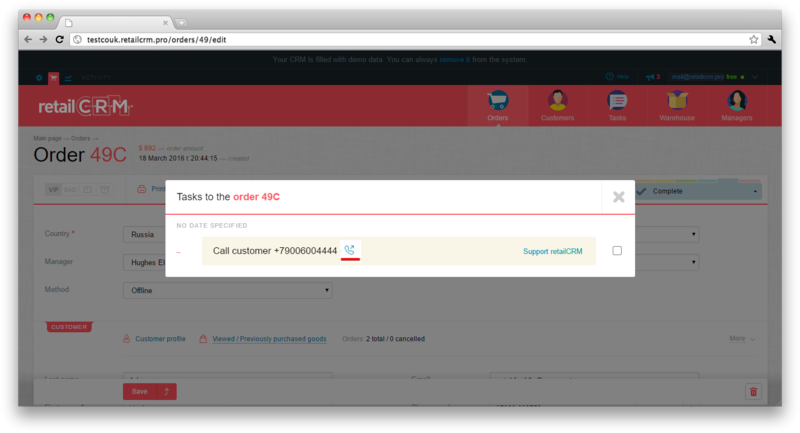 When the customer or order card is changed, a binding is added to existing calls. Checks if there is a call without binding when changing phone number field in order or customer card . 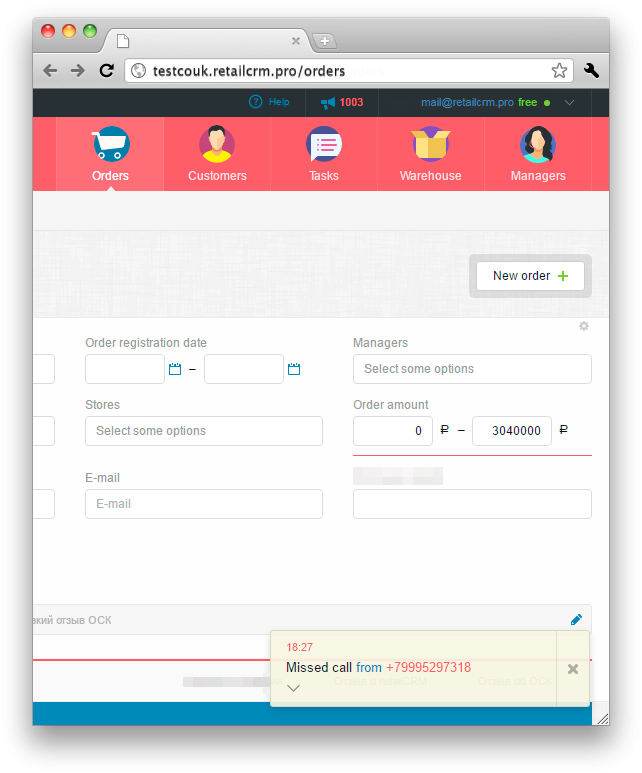 Checks if there is a call without binding when adding order or customer. 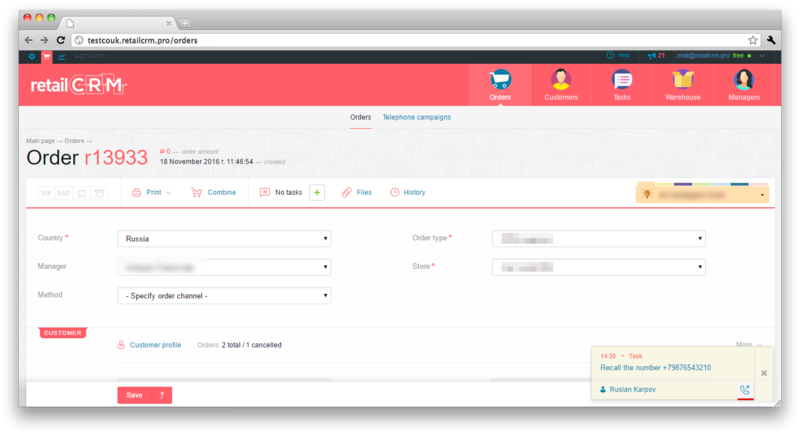 Takes order or customer history from the binding with the call.